PanARMENIAN.Net - ACBA-CREDIT AGRICOLE Bank and the European Bank for Reconstruction and Development (EBRD) have signed a loan agreement worth $17 million, the Armenia-based bank's press service said in a statement. ACBA said it will use the loan to finance small and medium-sized businesses in Armenia. Accordingly, $3 million will be spent on financing enterprises established or headed by women under the Women in Business program, while some $4 million will go to the implementation of energy-efficient projects through ACBA-Leasing, a member of the ACBA-CREDIT AGRICOLE financial group. 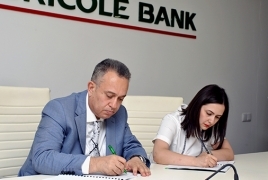 Under the agreement with the EBRD, ACBA-CREDIT AGRICOLE Bank will finance SMEs mainly in Armenian drams.